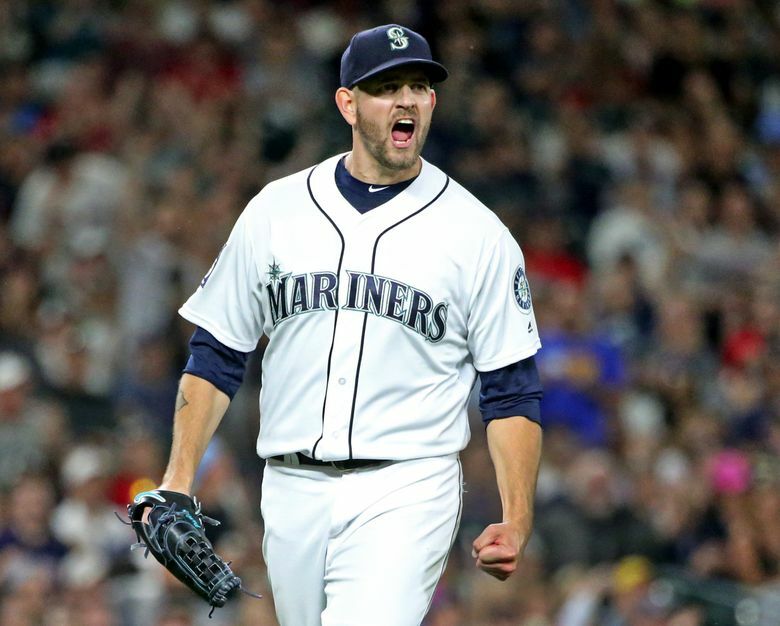 Pitchers James Paxton, David Phelps, Nick Vincent and Eramso Ramirez along with catcher Mike Zunino have agreed to one-year contracts for the 2018 season. The Mariners avoided arbitration hearings for their five remaining eligible players this offseason prior to Friday’s 10 a.m. deadline. Pitchers James Paxton, David Phelps, Nick Vincent and Erasmo Ramirez and catcher Mike Zunino all agreed to one-year contracts. Per club policy, the team did not disclose the contract figures. However reports and sources have leaked some of the contract information. Sources said that Paxton, who is in his second year of arbitration eligibility, will receive $4.9 million in 2018, an expected bump up from the $2.35 million he made in 2017. The big lefty posted a 12-5 record with a 2.98 ERA in 24 starts and was named the Mariners’ Pitcher of the Year by Seattle chapter of Baseball Writers Association of America. He set career bests in wins (12), starts (24), innings (136), strikeouts (156) and ERA (2.98), despite going the disabled list twice for a strained forearm in May and a strained pectoral muscle in August. In his first year of arbitration eligibility, Zunino, 26, will make $2.975 million in 2018, which is a nice step up from the $570,000 he made in 2017. It was a breakout year for the Mariners’ catcher. He set career highs in runs scored (52), hits (97), doubles (25), home runs (25) and RBI (64). His 25 home runs were third most among MLB catchers, trailing only Gary Sanchez of the Yankees (33) and Salvador Perez of the Royals (27). Phelps, 31, is in his fourth and final year of arbitration eligibility and will earn $5.5 million in 2018 and will be a free agent following the season.Phelps won his arbitration case against the Marlins last season and was awarded a $4.6 million salary in 2017. After being acquired by the Mariners, Phelps posted a 2-1 record with three holds and a 3.12 ERA in 10 relief appearances. But he did have two stints on the disabled list late in the season, which led to season-ending elbow surgery to remove a bone spur. There were no numbers reported for the salaries of Ramirez and Vincent. Ramirez, 27, made 11 starts with the Mariners after being acquired from the Rays on July 28 in a trade for Steve Cishek. The little right-hander posted a 1-3 record with a 3.92 ERA, including seven quality starts of six-plus innings pitched and three or less runs allowed. Ramirez is in his third year of arbitration eligibility. He made $3.125 million last season and was projected to make around $4.7 million in 2018. Vincent, 31, made a career-high 69 relief appearances in 2017, posting a 3-3 record with 29 holds and a 3.20 ERA. The 29 holds were second most in MLB. He didn’t allow a run in 57 of his 69 appearances and was named The Mariners’ Unsung Hero by the Seattle chapter of the Baseball Writers Association of America. He’s entering his second year of arbitration eligibility. After making $1.325 million in 2017, he was projected to make $2.7 million in 2018. The Mariner have had just two players take them to arbitration — Freddy Garcia in 2003 and Tom Wilhelmsen in 2014. Garcia won his case and was awarded $6.875 million while Wilhelmsen lost his and was given $1.4 million instead of the $2.2 million he filed for.